I am a stay at home mom of three great kids. I love the Lord and it is my strong desire to raise my kids to love God and know Him personally. I married my best friend 15 years ago and love him more every day. Some things I like to do are jogging, "antique" shopping, gardening, looking at decorating magazines, and sitting out back on my swing watching my kids play. I am making my house a home a little at a time and want my home to be comfortable place for my family and friends to gather in. It is a fun challenge to do it on a tight budget. Beautiful and "cheap" things are a passion of mine! I bought these potato sacks at the Country Living Fair last year. I love the other lampshade I made using one of these potato sacks (you can check out that post here), so I decided to make another one. This time I used the burlap and blue one that says "Grow with P & E Seed Potatoes. I forgot to take a before picture, but I found this lamp at a garage sale for $6 including the drum shade. The lamp was pink and I spray painted it a color called "Bright Idea." I then laid the shade out on the potato sack and cut it to size adding about 2 inches to fold under at the top and bottom. I used spray adhesive to glue the sack to the shade then I hot glued the edges around on the inside of the shade. The lamp sits in my sunroom on top of the metal table I also got at the Country Living Fair (you can read about that makeover here). Everyone asks me what P & E stands for. I have no idea, I just love using repurposed items. It adds character to a home, saves money, and is better for the environment. Hope you are enjoying your 4th of July weekend! So cute! I love how you placed the lettering on the shade. It looks so Pottery Barnish. :) The yellow was the perfect color too. 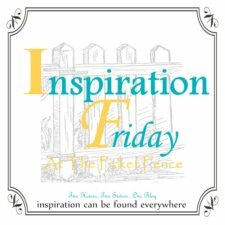 Thank you for sharing it with us at Inspiration Friday. How very cute! I wish we lived near where the Country Living fairs are held. They always look like so much fun! I LOVE it, Amy!!! It turned out so good!! Soooo cute! Love the potato sack and the letters are so bold and fun! I am in deep and serious love! it looks great. Wow, you got a great deal on that lamp and I'm lovin' your makeover....good job! Hope you're having a wonderful summer! So cute! Love the crafty idea! I might just have to borrow this idea. I love it!! A potato shack lamp. Very cute.